There’s nothing quite like slapping some burger patties on the good ol’ BBQ, beer in hand, while you chill in your backyard with a group of friends on a toasty summer Saturday afternoon. With all the delicious craft burgers that seem to be popping up all over the place, you might even be tempted to recreate some in your own backyard, adding fried eggs or beer-battered jalapeños to the toppings. This can either have a tasty outcome, or a disastrous ending to your fun-in-the-sun Saturday shenanigans, leaving your friends to forever cement the images in Instagramland with photos of your ruined craft burger attempts. 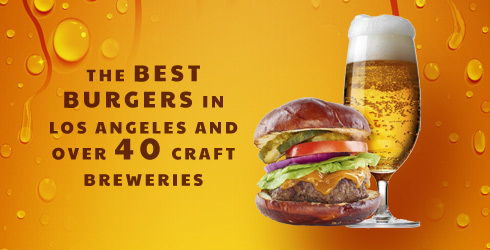 Perhaps you should scrap the BBQ plans and head to LA Weekly’s inaugural Burgers & Beer celebration, taking place from 3pm-7pm at the LA Coliseum August 8th! Yes, LA Weekly, the people behind some of the best food events in LA has a new event scheduled, showcasing some of LA’s hottest burgers, which will be complimented by some of the best craft beer breweries. Enjoy burgers crafted by these fabulous restaurants: Animal, Abigaile, Bacaro LA, Badmaash, Barrel & Ashes, Belcampo Meat Co., Bouchon Bistro, Cassell’s Burgers, Escala, Grill ‘Em All, Haché LA, Hamburguesas Punta Cabras, Hawkins House of Burgers, Little Dom’s, Local Table, Mariscos El Cristalazo, Meat District Co., Messhall, Myke’s Café, Mrs. Fish, Perch LA, Pie n’ Burger, Pink’s Hot Dogs, Plan Check Kitchen + Bar, Pono Burger, Rush Street Culver City, Salt’s Cure, Seoul Sausage Company, Simmzy’s, Slater’s 50/50, The Churchill, The Counter, The Hudson, The Independence, The Hungry Cat, The Pikey, The Rockefeller, The Tripel, Vaka Burger, Venice Whaler and WOODSPOON. Sip on beers provided by: Ace Cider, Alosta Brewing Co., Anchor Brewing Co., Angel City Brewery, Beachwood BBQ & Brewing, Belching Beaver Brewery, Boomtown Brewery, Bottle Logic Brewing, Bravery Brewing, Brewery Ommegang, Cabotella Mexican Ale, Drake’s Brewing, The Dudes’ Brewing, Eagle Rock Brewery, El Segundo Brewing, Fireman’s Brew, Firestone Walker Brewing Company, Golden Road Brewing, Humboldt Brewing Company, I&I Brewing, Karl Strauss Brewing Company, King Harbor Brewing Company, Kinetic Brewing Company, Kona Brewing Co., Ladyface Ale Companie, The Lagunitas Brewing Company, MacLeod Ale Brewing Co., Mumford Brewing, Ninkasi Brewing Company, Phantom Carriage Brewery, St. Killian Importing, Strand Brewing Co., Sudwerk Brewering Co., Telegraph Brewing, and Wolf Creek Brewery. Use my link to purchase your tickets, and join me August 8th at what is sure to be a delicious day! This event is 21+ with valid ID. Portions of the proceeds benefit Homeboy Industries. LA Weekly has invited me to attend this event. All opinions, like always, are my own. Enjoyed your story of epiphany and independence! Wondering if you will publish a review/pics of the burger event, which I also attended. I skipped the beer (not a favorite anyway, so wasn’t a hardship) and visited 18 of the 30-odd burger stands, was overwhelmed, foraged gamely on anyway, and several vendors let me take a few home at evenings end. Now I am eager to hear what others thought! I don’t see my favorite Diddy Riese?